Study Abroad Blogs – Kingston is my classroom! When I thought about studying abroad, I thought about the world being my classroom and that is exactly what I am experiencing here in Jamaica. One of the coolest parts of this trip is that Professor Brown is also here to guide us and teach us things along the way. As Dr. Brown would say “Its all about navigating the space and bringing it to the contemporary.” Even while we are driving from destination to destination there are always questions and discussions along the way. I appreciate all the conversations we have because we are not looking at examples from a textbook… we are looking at everything with our own eyes. New Paltz classes vs. Jamaica Study abroad learning? Like I said completely different because what you are learning is right beside you or not to far away. Being in Jamaica with the group and the professor is so great because we learn from each other and from Dr.Brown. There is so much about Jamaica that one begins to understand when they see it with there own eyes. Jamaican history runs deep from the indigenous Taino’s, colonialism, slavery, emancipation, to independence and present day. We also have three books we are reading in Jamaica which help us further understand the culture. The first book is In Focus Jamaica by Peter Mason, Rastafari by Barry Chevannes, Britain’s Black Debt by Sir Hilary McD. Beckles. 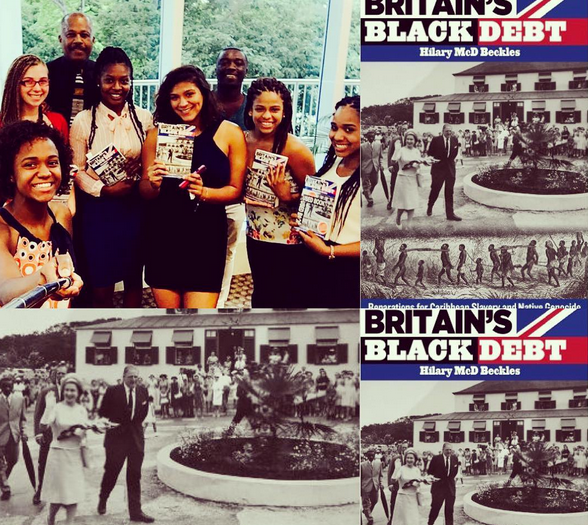 JSLP 2016 had the privilege of meeting Sir Hilary Beckles- Vice Chancellor of the University of the West Indies at the UWI Mona, where we discussed Britain’s black debt and reparations for the Caribbean slavery and native genocide. Sir Beckles was so intelligent about the subject, It was so amazing to be having a discussion with such a smart man who has made an impact throughout the Caribbean and continues to make a difference. I encourage anyone who is reading my blog to look up Sir Beckles and reparations for the Caribbean. By the way this was one of the most amazing parts of the trips for me! Who gets to sit with the author of many books/ Vice-Chancellor of the University of the West Indies everyday? I will never forget that day. Volunteering at the Kingston YMCA is also an amazing part of learning about the Jamaican culture. Being counselors to the children and working with the other Jamaican counselors is a great way to see what it is like to live in Jamaica with the different conversations with the children and adults. Just by talking to the counselors, I have learned so much about Jamaican that tourist going to resorts would learn. Before the trip, I was warned about the danger in Jamaica but throughout the time Ive been here I have learned that people here are amazing, joyful, smart and much more but the under development of the country is what keeps the people from progressing hence why reparations from Britain is important. Jamaica and its culture has influenced many others in many ways through music, food and much more. Jamaica deserves respect for what is has been through and how the people continue to strive everyday. I am tremendously happy I made the decision to study abroad in Jamaica. Beauty, love, kindness and much more! Here is the song by Chronixx called Smile Jamaica! This song is so touching and shows exactly how beautiful the people and the culture is!